An explanation of what design is and what creativity means- at least from the perspective of the newsroom of this magazine. I was having a coffee in a cafè in Turin, Italy. It is an ancient place that’s been open since the 20’s. The owner recently decided to invest some money in redecorating, changing some details to create a more contemporary experience. I was there with my husband, we both ordered espressos and once the coffees arrived my husband exclaimed with irony, “Look at these amazing design spoon!”. We found ourself mixing the sugar in the coffees with some laser cut steel spoon. These spoons were a bit extravagant in their shape, yet not really able to collect liquid. I can definitely say that you could mix the coffee with them but you can’t use them to pour coffee from the cup into your mouth. The detail of functionality had been considered not relevant: what was most relevant was the need to create something extravagant, something that would mildly shock and give the user feeling of something contemporary and designy. To summarize it in two words: something creative. I think that the word design and the word creativity are some of the words with more meanings that I can recall: it is worth the time to define what design is and what creativity means, at least from the perspective of this magazine. During my first lesson at Central Saint Martins my professor pointed out how scientists are the most creative people on the planet. This was a familiar notion for me but I saw how many of my colleagues were outraged by it. If you think about it, you easily realize how scientists need to be extremely creative in the way they solve their problems, in the way they find solutions to scientific problems. They need the ability to think outside the box and, at the same time, structure and prove their deductions using datas and numbers. If we look at creativity from this perspective, we see how the creative process is not something that comes “from above”- it is not a tantrum. In this perspective, creativity is not something that is inside some individuals and absent in some others. It is more a skill that can be trained, a tool that can be learned. An example of a creative prototype of a robot based on the concept if domino. 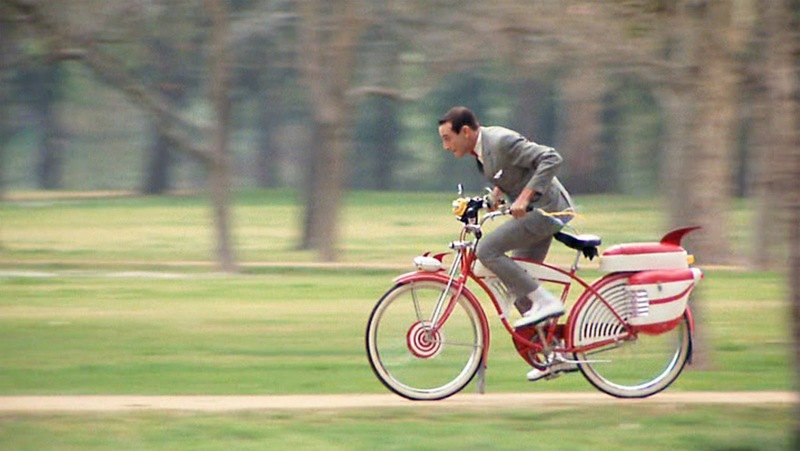 | Pee-wee's Big Adventure, by Tim Burton, 1985. However it is understandable that fresh students of a design college are perplexed or shocked in front of such a point of view. I see the same reaction in my students in Italy or China: when I first present this point of view they are always reluctant to accept it, why? The reason is simple and, as I like to call it, romantic. There is a romantic idea of professions: lawyer, reporter, architect, designer, … if we close our eyes we can imagine very clearly what these professions may looks like. This idea is sustained by movies and by the desire of the student to shape their life accordingly. When I started to study product design I was driven by the romantic idea of Ettore Sottsass: I wanted to travel, create, design without worrying about money or compromises. I was picturing him as a master, who would never compromise with the market, imposing his visions to the point of creating an international avant garde: Memphis. For this reason I understand perfectly when my students are kind of disappointed when I tell them that being creative doesn’t mean sketch the first thing that comes to your mind but to fail on small iteration, collect data, build a new iteration and so on… until you find the right solution. If the word creativity has this ambiguity, the word design is not immune. Especially when used as an adjective to describe something, “This is an amazing design spoon!” Means “This is a very extravagant, shiny, not really functional spoon!” The vibes you get from that spoon are of something contemporary and as Tenny Pinheiro in “The service design startup: design thinking gets lean” would say “..the product is just a service, it serves to make the user feel contemporary vibes..”. Again, this definition of the term is absolutely correct, but I think it is worthed to define what design means from the perspective of the newsroom of “Method Pliant”. Design is a verb. It is synonymous to project. Design for us is a process. Design can be an extremely creative process, in the sense that it can involve very innovative way to prove concepts, develop ideas and test iterations. To conclude, if we say “Design is a creative discipline”, it means that to be able to be good designers you must be extremely creative in collecting data, building prototypes, testing iterations and then improve them on the base of feedback. Everyone can be a designer just as everyone can be creative. These are not talents, these are skills and tools anyone can learn and acquire.